My PS3 has turned into a Netflix machine. I’m an ashamed gamer. 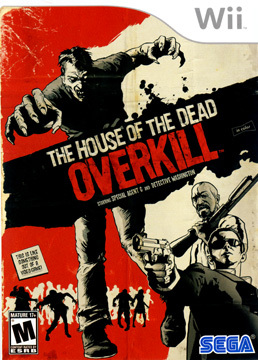 The House of the Dead: Overkill (first-person rail shooter) published by Sega and made for the Wii. I know I know it isn’t new, it came out the beginning of 2009, but I didn’t have a blog then plus it’s zombie week so anything undead goes. I like this game it because it presents itself like a over-the-top Grindhouse flick and because it has a Guinness World Record for the most profane video game in history (189 F-bombs to be exact). I think if they ever made this a movie Samuel L. Jackson just has to play the character Detective Isaac Washington. Have you played HD: Overkill? What did you think? Check out its Grindhouse style trailer below. Nintendo clearly triumphed at E3 this year. The Kinect (previously Project Natal) is cool and all and no one really seems to care about the PlayStation Move much. But we already knew about both of them so all they did at E3 was show us some gameplay. There were rumors about Nintendo developing a 3DS so (no surprise there), BUT what did get me in a frenzy was the incredibly amazing list of 3DS games. The release date is up in the air because these guys just can’t seem to get it right. First it was announced to be released March 2011 but recently I heard October or before Christmas which makes the most sense. Outside of the handheld realm, Nintendo announced a new Donkey Kong Country Returns for the Wii. They also showed us the new The Legend of Zelda: Skyward Sword which they have been teasing us for almost a year with the concept art. When I heard rumors of a Super Scribblenauts I wondered what else could they add to the 22,802 words they already had. One word: ADJECTIVES!!! To put the cherry on top they also included combo words. Ever seen a “gentlemanly red raptor“? You will also be glad to know everything that was broken in the first Scribblenauts is fixed in the new one. I’m already giving myself a migraine trying to think of the most random yet extremely amazing adjective word combos for Super Scribblenauts. Kirby’s Epic Yarn– I always liked Kirby because he was cute, pink and had an incurable sweet tooth. Now he’s made of yarn!